SCROLL DOWN FOR PHOTOS. Price includes FREE SHIPPING/INSURANCE. Use the "Go Back" link at the upper right to return to the previous page and make your purchase using the "Buy Now" button. 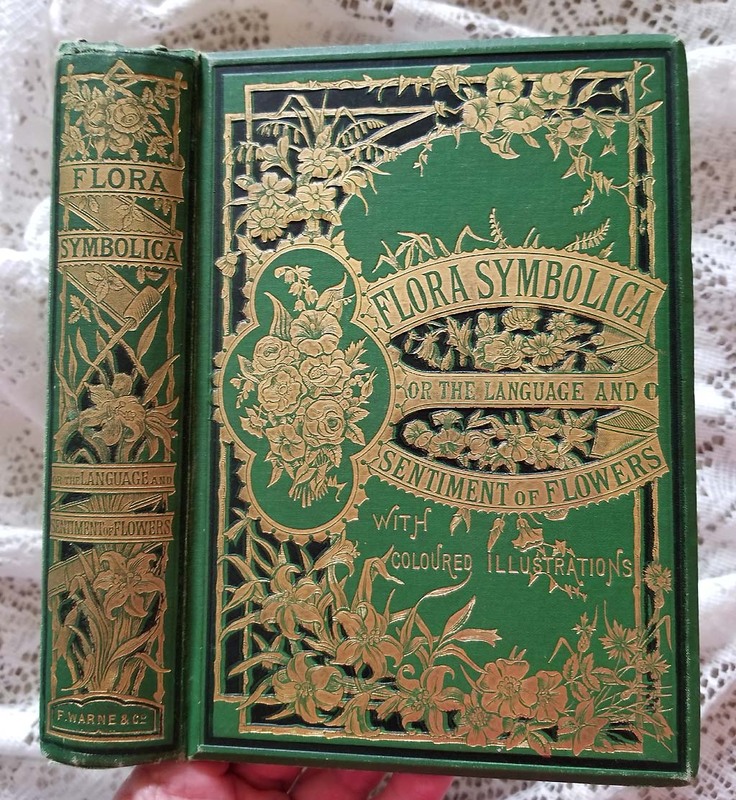 This exceptional book is entitled Flora Symbolica or the Language and Sentiment of Flowers. It is a large volume and is illustrated. The author is John Ingram, and it is undated (as most Frederick Warne volumes are) and dates to the 1880’s period. This fancy cover hardbound book has green cloth-covered boards, with ornate plating in gilt and black. The spine is also highly decorated. It is in VG condition with light foxing on the first few and last pages, with occasional foxing on the inside pages. The inside wear is also minimal. 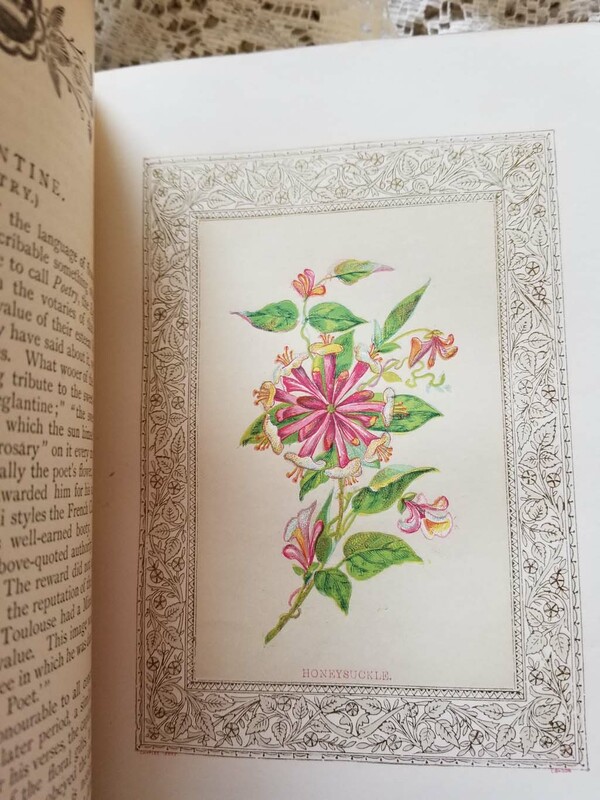 The 368 pages are brightly gilt tipped, and there are 14 full color illustrations. The text block is tight and the flyleaf papers uncracked. The cover boards are beveled and the corners and spine have minimal shelf wear. Size is 5.5 x 7.75 inches. At the front flyleaf if a previous owner’s very small name label. This book is highly sought after, and almost never found in this wonderful condition. 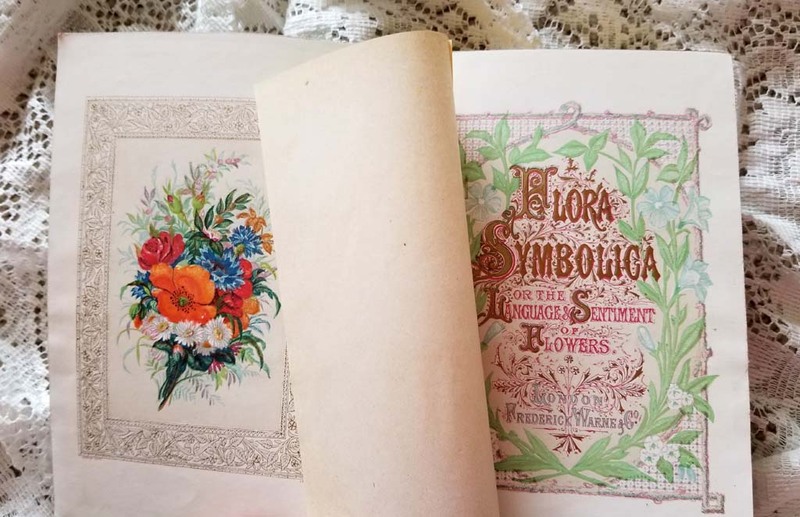 In Victorian times, a lady or gentleman would signal their intentions silently by giving flowers to their beloved, and each flower symbolized a virtue. For instance, the red rose meant True Love, pansies meant someone was Thinking of You, hydrangeas signaled Boastiness, and the little violet portrayed humble Faithfulness or Modesty. A bride’s bouquet might contain white roses, which stood for Innocent Love. Indeed, each flower had its own sweet sentiment. 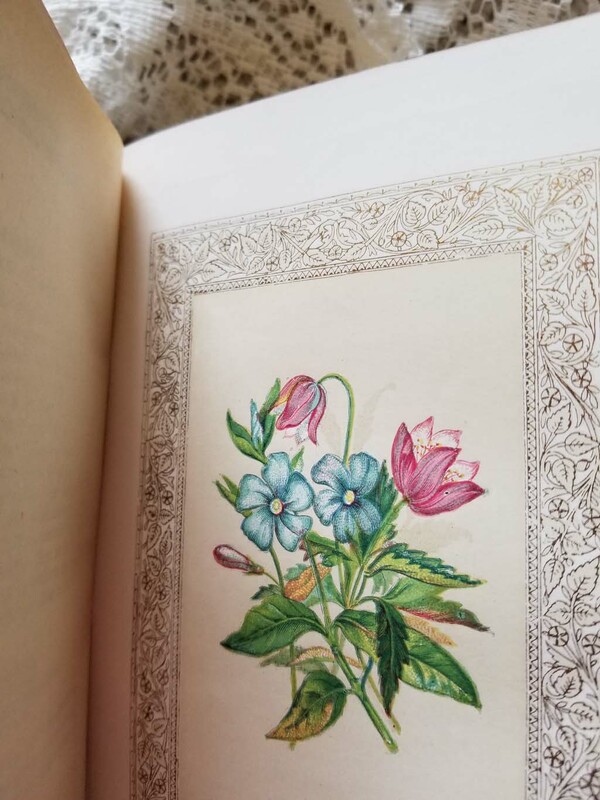 The color illustration pages are magnificent, with each flower having a gold scrollwork rectangular cartouche that surrounds the floral image. 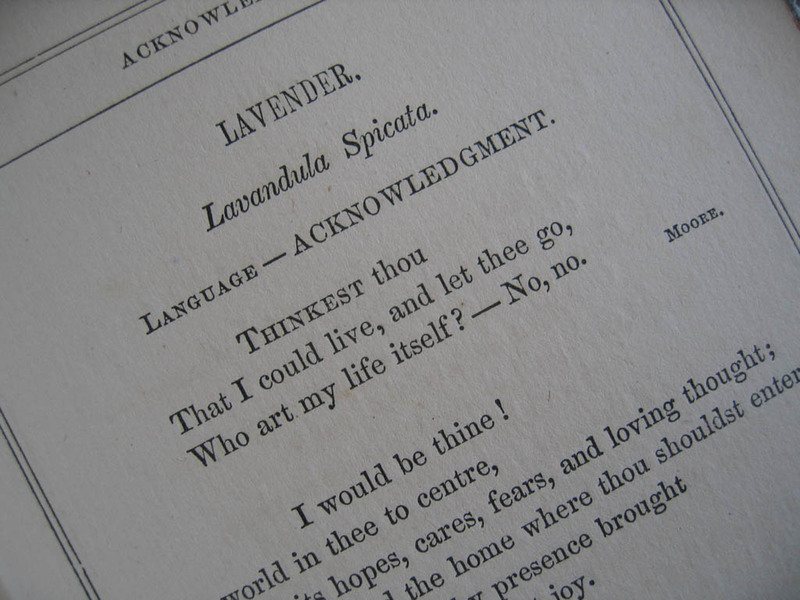 On the Violet: (Modesty)…the rank which this timid little blossom holds in floral calligraphy is a very exalted one; indeed, the rose excepted, there is not a flower that tolls its perfume on the passing air which is so generally admired and belauded. 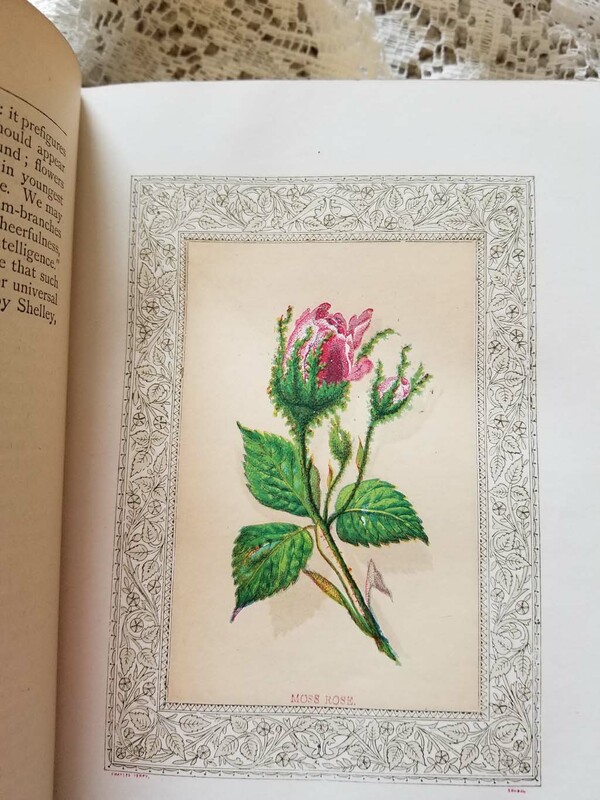 At the back is The Vocabulary, a quick alphabetical index for each flower and its assigned virtue. The second part of The Vocabulary details the reverse; that is, a virtue, and what flower would be assigned it. In this manner, one could pick an emotion and award the appropriate flower. Or, taken further, one could compose a bouquet of flowers to convey many secret messages. For instance, Danger would be assigned the Rhododendron, Early Attachment would be a Thornless Rose, Depart would be Dandelion seeds in the Ball, a Belle the Orchis, Beware a sprig of Oleander, Indifference the Mustard Seed, Justice the Rudebekia, Freshness taking the form of the Damask Rose, Fickleness was assigned to Parsley, and so on. Many Victorian picnic games centered around flowers gathered and the guests trying to assess and guess their symbolism. Indeed, a fine coffee table presentation book, and absolutely a wonderful gift for Valentine’s Day, Mother’s Day, birthdays, or holidays. Please note that all our prints are copyright protected, and that they may absolutely NOT be reproduced in any manner without our consent.